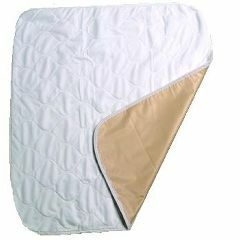 Features antimicrobial protection that eliminates odor on contact. Kills 99.9% of odor causing bacteria within 10 minutes of contact. The Haloshield coating acquires the chlorine molecules during washing and anchors them to the surface for renewed protection. Ultrasoft moisture-wicking top layer keeps users dry. Super absorbent inner layer quickly traps fluids. 100% waterproof protection for bedding and chairs. Non-irritating for sensitive skin. Stops odors and kills odor-causing germs. Eliminates the unpleasant, embarrassing urine odors that result from incontinence. Kills 99.9% of odor-causing bacteria within 10 minutes of contact with the HaloShield underpad. losses absobancy with was. losses absorbancy with wa. losses absorbancy with wa. Has anyone had a problem with a pad not being the size it was supposed to be? I bought one somewhere else supposed to be 32"X36". It was 33"X34". The company would not refund or replace and I am looking for another company to buy from that will back up their product. How many to a case?